Wow, I can smell it! It's really Christmas, isn't it? And we celebrating this holiday once a year. What does #MerrySMChristmas mean to you? How will you celebrate this yuletide season? Let the atmosphere be decorated with Christmas lights, lanterns, put your star on the top of your Christmas tree and prepare delicious food for everyone. Embracing children with gifts so they know that spirit of Christmas is about giving and sharing selflessly. Ninong and ninang where are you, anyway? Have you ever completed the 9 days of Simbang Gabi? Well, for teenagers somehow they interpreted it as "Simbang Tabi". Enjoying yummy "puto bumbong" and hot bibingka right after the mass. Even when it's not Christmas we should help, compromise and love one another, right? Any given day can be a Christmas by giving in, helping the less unfortunate even with the little things, for giving love, unity and forgiveness follows. What Does #MerrySMChristmas Mean To Me? My #MerrySMChristmas means something special. Not only for myself but for everyone. Most importantly for my daughter who motivates me day by day. I don't have enough time for her since I'm busy. As a cellphone technician I have to go to work 6 days a week. Only during weekend for when me and my family come together. My wife and I used to be on SM every Sunday to attend the early mass with our baby girl Sephil. Christmas is rather a perfect opportunity for us. Our family bonding moment take its place on nearest SM mall. Dining in one of my child's favorite fast food resto then go on shopping right after my pay day. Watching people buying gifts without worrying how much would they spend. That's how a once in a year holiday changes our normal daily routine into an exciting one—that's Christmas! It is the visualization of the day or days Jesus Christ's birth. It is a religious event not just happening here in the Philippines but all over the world of Christianity. We Christian believe that Jesus lived and died to save humanity. In others, it is a celebration of year ending and welcomes new year with as much excitement and positivity. We believe that this kind of celebration takes away bad luck and letting good luck comes in to ones person's life. For practical people, it is a time to relax, enjoy the holidays and family reunion. This is the longest holiday for the whole family even for classmates or 'barkadas'. We are free to take vacation giving us enough time for bonding moment. Workaholic like me, this is the time for receiving my 13th month pay and bonuses, if any. I look at these days because I have to pay my debts. Some people may think buying a new house or investment in a complementary businesses. But we know that the majority will be spent for the preparation of Christmas Noche Buena and for New Year's Media Noche. For children, Christmas is a gift and pleasure. Admit it, kids are really the star of the Christmas day. This is the time where they receive gifts or new things such as apparel, clothes and toys. This is also the time that their godparents are giving them special present. 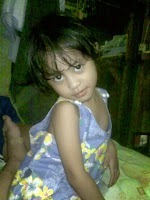 Hi, Ninong and ninang don't forget your dear Sephil. Every Filipino may have differences in celebrating the Christmas season. May also have distinctive meaning of Christmas to every person. But even with diverse meanings and techniques of keeping the holiday. What important is the spirit of love, willfulness, compassion, unity, cooperation and forgiveness. This is the true meaning of Christmas. In every event of difficulties experienced by Filipinos. We can still afford to have fun on Christmas day. 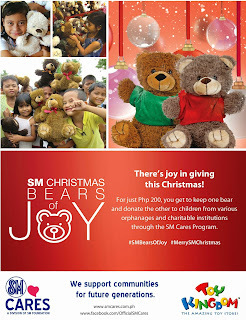 SM Cares’ Bears of Joy also help us bringing happiness this yuletide season. Share your joy this Christmas! For just Php 200, you get to keep one bear and donate the other to children from various orphanages and charitable institutions through the SM Cares Program. You can check everything's here for a #MerrySMChristmas and be updated with SM Supermalls events this season. We wish you a #MerrySMChristmas Kwentology avid readers and a Happy Happy New Year too! Thank you for reading Everybody Deserves a #MerrySMChristmas Let's Share Our Joy this Holiday Season posted on the website Kwentology if you want to redistribute this article please include the link as the source. Have some kuwento to share? Contact us! I have very similar feelings about it, so it was very pleasant for me to read this article. After being a parent for a long time, it’s very strange for me to hear about Christmas without kids. Because in our family it’s second most important celebration after birthdays. Christmas and New Year are truly the most expensive and in the same time most magnificent holidays! It is not very X-mas theme but still could be helpful, so be sure to check out theTop 10 Essay Writing Services.